In this paper, author tried to find relation of foreign direct investment inflows with its determinants like growth rate, interest rate, exchange rate, inflation rate, fiscal deficit, openness in India during 1971-2015 through causality, co-integration and vector error correction models. In this paper, it was attempted to explain clearly that how foreign direct investment inflows and outflows have changed during several financial crises in different regions of the world since 1970s in support with a historical analysis over global financial crises. The paper concludes that FDI inflows in India has been catapulting at the rate of 21.56% per year during 1971-2015 and exponentially at the rate of 0.6044% per year significantly. It has four upward structural breaks in 1985, 1994, 2000 and 2006 respectively during the specified period. FDI inflows in India has causal relation uni-directionally with fiscal deficit, and bi-directionally with inflation, exchange rate, interest rate and growth rate during 1971-2015.Johansen co-integration test confirmed that Trace Statistic contains four co-integrating equations and Max Eigen Statistic has three co-integrating equations. VECM is stable, non-stationary and not good fit for four estimated equations and error corrections for the equations of change of interest rate and inflation rate showed significant with speeds of 23% and 103% per year. The paper also concludes that FDI does not cause Granger financial crises, but financial crises do cause Granger FDI. Keywords: Foreign Direct Investment, economic growth, financial crises, co-integration, vector error correction. JEL Classification: C23, C33, F21, F01, O55. Cite as: Bhowmik, D. (2018). Financial Crises and Nexus Between Economic Growth and Foreign Direct Investment. 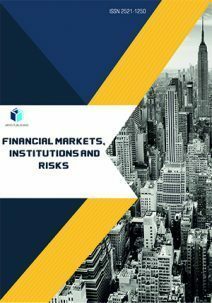 Financial Markets, Institutions and Risks, 2(1), 58-74.